This week the Grade 6 class is tackling a very difficult assignment: writing a properly formatted persuasive essay. No student enjoys the dreaded essay assignment, but it is a valuable lesson to learn. Essay writing is an ingrained part of the Western academic tradition. As I tell my students, in school across the West (especially secondary schools), students are asked to write essays as part of their language arts curriculum, history courses, and exams. At universities in the US, Canada, UK, and Australia, essay exams are standard for courses in the humanities. While I understand that this writing assignment is dry and uninteresting for students at this age, I feel it is necessary and valuable for students to begin learning to properly write an essay early in their academic careers. I've had many former students tell me how glad they were to have learned to write an essay in my class when they did. A properly formatted, five-paragraph essay is a very formulaic kind of writing. This is one of the main reasons essays are commonly used for exams. Writing an essay properly forces the writer to think critically about a topic and prove any and all statements made about it with facts or details. Please see the graphic organizers and examples below to learn more about how an essay is organized. 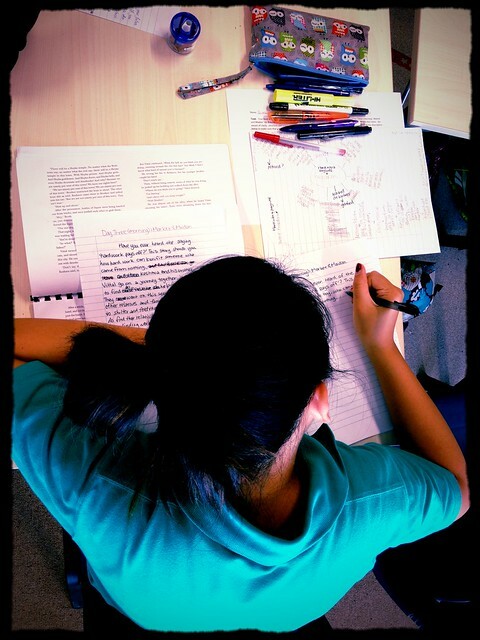 This week, students are putting their first ever essays though the entire writing process. Many students won't take this long to finish, but I want to make sure everyone has enough time to complete the task. The students will be writing essays on one of the following questions of their choice. Which of the four main characters from “Science Friction” do you feel you are the most like? Why? Please use examples for the story and your life to justify your answer. In School Story, do you feel that Natalie was cheating by slipping her story to her mother, the chief editor of a publishing company, and having her friend pretend to be an agent to get the story published? Why or why not? Of all the stories from Journeys that we have read in class this year, which, in our opinion, is the best? Why? Please use details from the story to justify your choice. Use the images below to help write your essay.